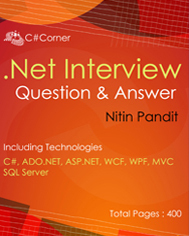 Hey this is good news for .net learner that Nitin Pandit has launched .net Interview questions with answers book. This book covers most frequently asked .NET interviews Questions and Answer. It will help you in doing quick revision so that you can be ready for the interview in day or two. I found a small bug at page 23. Break Statement Example uses "continue" instead of "break".